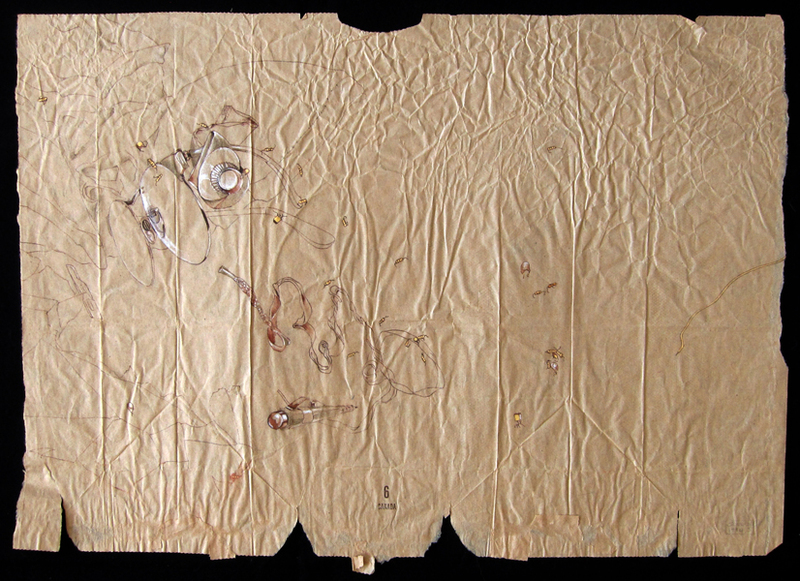 The "Archaeological Drawings" are drawings on paper bags, which are discarded three-dimensional objects. They work on several levels. At their most obvious, they are small excavations, with surface features and stratigraphy to be deciphered by the archaeologist and constructed into a coherent narrative. Additionally, the process of creating these drawings is like the process of excavating. The paper bag is a dense fibrous surface like an excavation surface. One must look beyond the first-seen to find what is drawn. They are drawn in brown ink on brown paper, letting the objects emerge slowly. The objects are household items, the modern equivalents of archaeological artifacts including pots, tools, and refuse. Exacavating and drawing these artifacts are both acts that transform the mundane objects into extraordinary finds. In these drawings, gold is sometimes added to emphasize the conversion of these common objects into precious artifacts. The more complicated pieces are not planned in advance. What will be "excavated" next is decided as the drawing progresses. At some point it becomes apparent that I am subconsciously creating a drawing of a place or event I have experienced. In this way, these drawings are excavations of my personal past. Finally, these drawings are artifacts that will change over time. Once archaeological objects are taken from their burial environments, it is difficult to prevent them from altering. The archaeological drawings/objects exhibit behavior consistent with that of objects which have been excavated: they will evolve in subtle ways.